M81, also known as Bode's Galaxy, is an impressive spiral galaxy in Ursa Major and is the largest galaxy in the M81 group of galaxies. 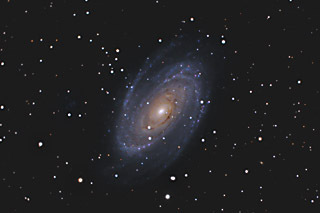 In a telescope, M81 is quite large with an apparent diameter of 27' x 14'. 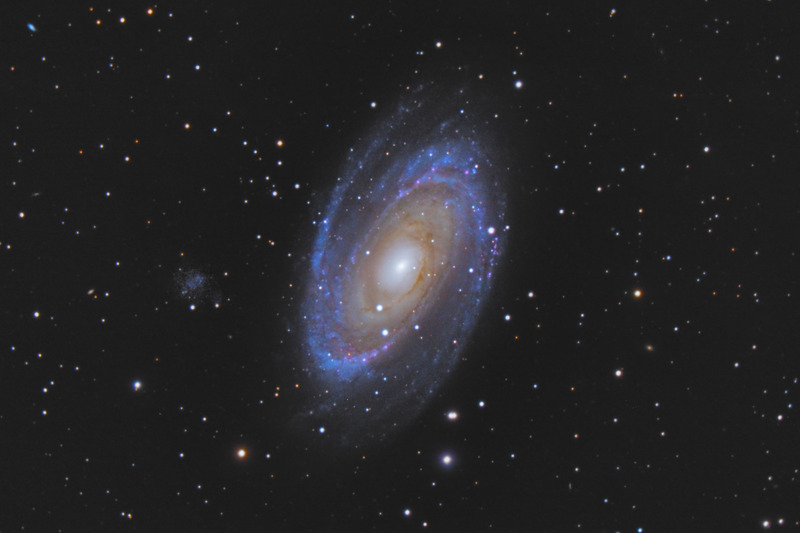 Morever, M81 is only 1/2 degree from its close neighbor, M82. The two galaxies are gravitationally interacting, and the dramatic distortions of M82 are proof positive that M81 is the winner in the collision. The faint galaxy to the left of M81 is Holmberg IX, a dwarf satellite galaxy of M81. Software Used Images Plus 4.5 for camera control, calibration, stacking, digital development, noise reduction, smoothing, and Lucy-Richardson deconvolution. Photoshop CS5 used for levels and curves, saturation adjustments, star shrinking, noise reduction, high pass filter, and color correction. Carboni Actions for additional saturation adjustments, noise reduction and smoothing. HLVG for addiitonal color correction. Registar for image alignment. Notes I employed some new processing techniques with image which allowed me to bring out some nice fine details. This image also captured Holmberg IX much better than my previous attempt. This image won 1st place in Digital Astro's Challenge Photo - Galaxy category for March 2012.